Prize will be awarded for the nicest hand painted Easter egg in two categories: children under 14 years of age and persons older than 14. New competition for children during the function – creating their own design for an Easter egg for which there will be a lucky prize winner. As always, there will be a ruffle, and the Slovak Band “Zmena 5” will be playing for your entertainment. Entry: $10 members, $15 non-members. Dinner: $15 (kids dinner $7). Reservations at evabilek@digisurf.com.au or 0425 739 372. From the Association’s newsletter: "Our younger dance groups 'Liptarik' and 'Liptaricek' will contribute to the evening's entertainment, as well as the Slovak Language School 'L. Stur' students. There will be prizes for some of our fathers, grandfathers and godfathers and a rich ruffle, too. Our Slovak music band 'Zmena 5' members hope you will enjoy listening and dancing to their music. Dinner will be prepared by the members of our Mothers Committee, whose secretary, Mrs Anna Slukova, will take your reservations on 9315 1778. The Slovak Social and Cultural Association Ludovit Stur Inc. invites you to the evening program of the Slovak dancers from Vojvodina. 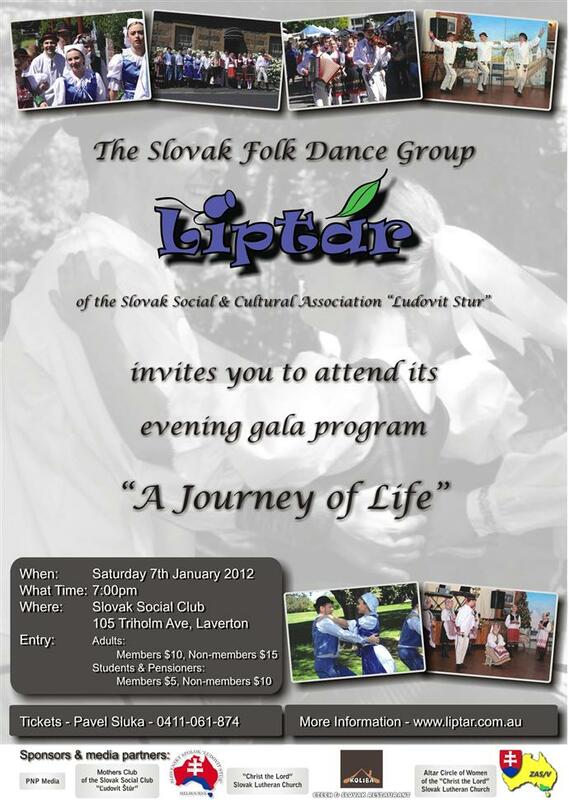 Two Slovak folk dance groups -- KOS Jednota Hlozany and SKOS Detvan Vojlovica -- will be performing their dance numbers. Come along to enjoy the show, which will be followed by a dinner dance afterwards. With voluntary contributions and countless hours of voluntary work by members of the Association, the "Slovak House" was built and officially opened on the 26 December 1981. Thirty years later to the day, The Slovak Social and Cultural Association Ludovit Stur Inc. are proudly celebrating Christmas and the anniversary of their community hub.